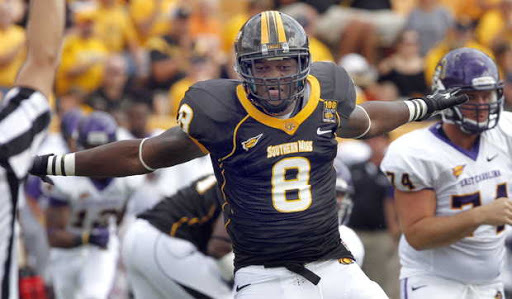 Would the Titans Draft Jamie Collins in the 1st Round? Much has been made of the Titans dismal defensive performance in 2012 and with good reason. I wrote extensively about it on my other blog Breathe If You Love Football. While other factors like the inability of the offense to stay on the field contributed, as well as the gaping hole at MLB left by injuries to Colin McCarthy and Zac Diles, the defense had issues of its own. What doesn’t get enough credit is how the defense improved once the Titans began taking advantage of the athleticism, speed and quickness of its two young linebackers Akeem Ayers and Zach Brown. The Titans showed some interesting defensive looks taking advantage of those two excellent players, so when Jamie Collins had such a standout combine performance, I took a good hard look at him and I like what I found. Would the Titans draft Collins early and by early I mean first round? This is an idea I have been floating in my mind for a while and the more I think about it the more I like the thought. A converted high school quarterback and safety, Collins is an impressive 6′ 4″ and 245 pounds. His high school and college resumes are impressive on their own. Collins showed his impressive athleticism at the combine in Indianapolis last week. One of the more impressive numbers is his 41.5 vertical jump. It was simply off the chain. I wrote about him in my draft prospective here Defensive Linemen Prospects. He is a versatile explosive defensive player who can play many positions and do a lot of things. However, he excels at being disruptive and getting to the passer and he has played from a 3 point stance. I imagine Gregg Williams and Jerry Gray are drooling at the thought of what they can do with him, and how he would improve the Titans defense. Would they take him at #10? Its a bold move for sure but I like bold moves if you like a player a lot. You have to consider whether you think he would be available in round 2 and after his impressive combine that certainly is a real question, especially when you consider teams that run the 3/4 are likely to be looking at him quite hard. His pro day is March 8 in Hattiesburg and I imagine there will be quite the crowd at hand to watch this impressive draft prospect.